I’ve been pretty good about supporting my son Myles’ cognitive, intellectual and academic development. However, while I’m intentional about putting him in positions to have experiences that light up his brain, creating those experiences myself is something I need to continually work on and something I’m so grateful to First Teacher for consistently encouraging. Hence, our lemonade stand! I love First Teacher and will do whatever I can to help the movement grow. The first step in getting the lemonade stand off the ground was getting permission to hold it at Dudley Cafe, which seemed like an ideal location during afternoon rush hour. On our way to Dudley Cafe, we bumped into the co-owner, Biplai (Mr. Biplai to Myles) in the hallway of the Bolling Buidling. Myles waited patiently for Biplai to finish his conversation. When he finished, I introduced him to Myles, explained that we are part of First Teacher and- “Can we have a lemonade stand?” Myles interjected. Biplai made clear that these kinds of requests weren’t usually granted, but that he would make an exception. Myles was elated and we went off to prepare. My husband, Eric, and I sent messages to many of the people in our village asking them to swing by to support Myles if they could. 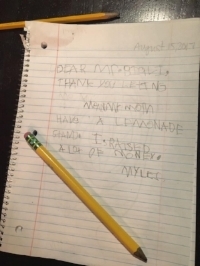 On the morning of August 15th, Myles excitedly announced “I’m havin’ a lemonade stand today!” as soon as he woke up. When we arrived at Dudley Cafe, Myles was very excited! I encouraged him to talk to a few of the people who were working on the patio. Suddenly all of that enthusiasm dissolved into social anxiety and he found himself “scared to talk to the people”. I offered to practice talking to people with him and we made our pitch to a man who was working near our table. 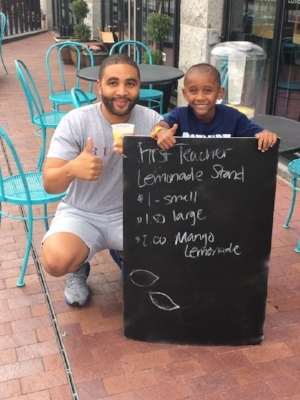 He ended up being Myles’ first customer and recommended that First Teacher connect with an organization that he’s part of! Despite that success, Myles felt most comfortable holding the sign with the lemonade prices while I was left making the pitch and serving lemonade. Lol! Many customers generously encouraged us to “keep the change” even after handing over $10 or even $20 bills! By the end of the day, we had only four cups of the lemonade left. The lemonade stand was a success! Later that evening, Eric co-hosted Trivia Night at Dudley Cafe as he does every third Tuesday of the month from 8pm-10pm. Myles has never been to Trivia because of his bedtime, but I figured we didn’t need to spend money on a babysitter since we had a pretty laid back day the next day and he didn’t need to be awake early in the morning. It was a great chance for Myles to see his dad in a way that he wouldn’t get to otherwise. When we sat at our table, Myles pulled out his notebook and began writing a thank you note to the folks at Dudley Cafe. After the first quarter, Eric thanked the shift manager, Tu, for supporting the lemonade stand earlier that day and told the crowd a little about First Teacher. I then felt the need to jump on the mic and tell the audience about how rapidly the brain grows between the ages of 0-3 and if we are lighting up kids brains at that prime then we are maximizing their ability to realize their brilliance and potential. Someone in the audience said something that I didn’t quite understand, but Myles clearly did. As I was asking the person to repeat themselves, Myles walked over to that person who gave him a cash donation to the lemonade stand in support of First Teacher. The next thing I knew, several people were offering donations (as well as suggesting that he have business cards made. lol!) In a few short minutes, Myles had collected just under $50 additional dollars toward his lemonade proceeds! A few days later in the First Teacher office, Myles received an envelope with his name on the front. He felt very important and said he was “never going to throw this envelope away.” When we got home, we read the thank-you note which told him he was awesome and that his work with the lemonade stand will help make sure that even more kids in our community are ready to be successful in school and beyond when they get to kindergarten. Legend has it that I got a little teary as I read the thank-you note to him. I will neither confirm nor deny that. I will confirm though, that Myles felt very proud of himself. The depth of what he did that day, the experience we had and the movement we’re a part of with First Teacher went over his head. But one day, since he’s never going to throw that envelope away, he’ll open it up and read the note inside and realize that First Teacher helped his mom to help him to have an experience with his community that was bigger than lemonade - An experience that was even bigger than himself.